This tutorial provides you with a foundation for working with Adobe Photoshop Elements retouching. It is the eighth lesson in the Adobe Photoshop Elements 10 Digital Classroom book. In this lesson, you’ll discover how to fix images using the photo retouching tools in Photoshop Elements. Some of the retouching you will do involves overall corrections, much like the ones you learned about in Lesson 5 “Adjusting Color.” You will also find out how to make selective changes to affect only portions of an image. You will see how fixing blemishes is a breeze when working with the editing tools. Within the Photoshop Elements Editor: The Photoshop Elements Editor defaults to the last panel layout that you used. Before starting, make sure your tools and panels are consistent with the examples presented in these lessons by resetting the panels. Do this by choosing Window > Reset Panels, or by pressing the Reset panels button ( ) in the Options bar. The resolution may be too low, so the image may appear pixelated. There is a limitation in the dynamic range of tonal values that are recognized. The better the camera, the more tonal values it can recognize. The result of a higher dynamic range is a smoother transition from one shade of color to another. The image has already been edited. You will see, later in this lesson, how even minor edits can affect the quality of your image, giving more reasons for being cautious when editing your images. Fortunately, there is a feature in Photoshop Elements that will help you determine whether images are lacking the information you need, before, and even while you are working on your image. This feature is the histogram. In this next section, you will open an image and make changes to the image. This will offer you the opportunity to make a comparison between an image with and without the information that is needed for retouching. 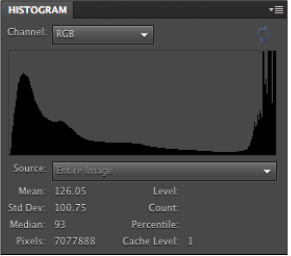 The Histogram panel displays the overall distribution of information about tonal values, in the highlight (bright), midtone (area between bright and dark), and shadow (dark) areas of an image. In this exercise, you will open an image and watch how your changes affect the histogram for that image. Keep in mind that you may open images whose histogram indicates a lack of information. These are the images that you can expect to have the most problems retouching and correcting. 1 If you have not yet launched Photoshop Elements, do so now. When the welcome screen appears, press the Organize button ( ) to open the Photoshop Elements Organizer. 2 In the Organizer, locate the image Smiles.jpg. Select the image, then click on the arrow to the right of the Fix tab and choose Full Photo Edit or simply use the keyboard shortcut Ctrl+I (Windows) or Command+I (Mac OS) to open the image in the Elements Editor. An image of a man and his son opens in the Full editing mode in Photoshop Elements. If you are not sure if you are in the Full editing mode, look at the Edit tab in the upper right corner of your workspace. Make sure that Edit Full is the selected item. Make sure you are in the Full editing mode. 3 Choose Window > Histogram to open the Histogram panel. Choose RGB from the Channel drop-down menu at the top of the panel. You may see an alert icon ( ) in the upper-right corner of the Histogram panel. If you do, click on it once to refresh the data in the Histogram panel. Notice that the histogram shows a lot of information, as represented by the mountain-shaped looking data spanning the panel. To give you an idea of how a good histogram looks as compared to a bad histogram, look at the examples below. A histogram displaying a lot of data. A histogram showing that data has been removed.